The essence of good design involves integrating various elements, materials and techniques. 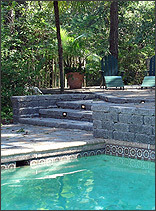 Your needs may include one of many possible hardscape elements such as a pool pavilion, sunroom, arbor, deck or gazebo. Whatever your needs for your exterior living space, our representatives will work with you to achieve the look and functionality you desire. Our production staff will handle all the details while keeping you fully advised as to scheduling and progress. A landscape project incorporating multiple hardscape elements doesn't have to be a nightmare…if you entrust your project to a reputable, professional, proven company. Old English Manor Wall is a rugged and rustic masonry wall with a weather worn feel capturing everything that is reminiscent of an old English courtyard. Keystone Country Manor offers the appearance and craftsmanship of hand laid stone with the advantages of segmental wall construction and design. Unique product features of Country Manor allow for use as free-standing border walls, planters, stairs or impressive entrance monuments. Keystone KapStones add the perfect finishing touch to your wall projects. Keystone KapStones are peaked column caps that have natural beauty and durability of cut stone, without the heaviness or high cost.